Have a heart for music but no head for business? Transform your musical skills into extra income: Talent to Treasure: Building a Profitable Music Teaching Business shows you how! Marcia Washburn, BA, MME, is a seasoned piano teacher, writing with authority about a subject she knows intimately and loves passionately: connecting people with music. Her warm and personable style immediately draws in the reader. Talent to Treasure targets the woman who wants to share her love of music with others while continuing to serve her family at home. It addresses the whys and hows of building a home business that blesses others without negatively impacting the family. It is proving to be a valuable resource for rookie and veteran teachers alike. The appendices alone are worth the cost of the book: sample policy letters, analysis of favorite teaching music, and more. The sample letters are available as Word documents at no charge so you can personalize them for your own studio. • How to teach using learning styles—how to be a people teacher first! • Great practicing tips & strategies for dealing with students who don’t! A second-generation piano teacher with many years of experience, Marcia Washburn sets out to help aspiring music teachers get started on the right foot. Many of the tips and principles she shares are ones that I had to learn the hard way! Although every teacher will have different approaches to the way they run their studio and do their teaching, Marcia’s book is sure to help new teachers think about issues that are all-too-often completely overlooked. She covers a wide variety of topics, including: evaluating your motive for launching a music teaching business, preparing for the practical side of running a studio, establishing appropriate policies and practices, learning how to communicate effectively, and some of the nuts and bolts of what and how to teach. This is a great starting point for a teacher, and even experienced teachers will probably take away a few new ideas, tips, or insights that will help them become better teachers and business owners. I know I sure did! I've been teaching for over 40 years and developed criteria for an ideal studio. . . If I wanted to write a book on what I do, I wouldn't be able to because it would duplicate your book. Without a doubt, your book is the finest I have seen out there. These are the subjects I instruct to new teachers and also let them come and observe teaching sessions. However, your book allows for instant reference in a tangible form. . . Congratulations for a wonderful contribution to music teachers regardless of the instrument they teach. The 141-page guide was easy to read and is very practical, unlike so many "how-to" books these days. . . . It's very much worth the purchase price. It will help the new music teacher start off her business right, without having to learn so many things by trial and error. Valuable resource for veteran teachers too! I am a homemaker, a pianist, and an artist. I like thinking of ways I can help out my husband financially while still remaining at home and taking care of my other responsibilities. 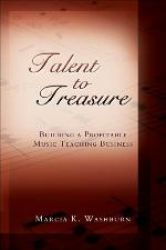 That is why I enjoyed Talent to Treasure: Building a Profitable Music Teaching Business by Marcia Washburn so much. I have thought before that I might one day teach children music lessons from our home when our children are a little older. I also plan on teaching our two eldest girls piano this year. This wonderful book from Marcia Washburn has given me all of the information I need to do both. Not only that, but I could even use much of her information to one day teach art lessons from our home. This valuable resource has great information for not only those who are looking into teaching students music and have no idea what they're doing, but also for veteran teachers too. I even think there is enough information packed in this book to help those who would like to teach other kinds of lessons to students as a home business. Marcia Washburn, a 40-year veteran of guiding young musicians in the joys of piano performance, has written an excellent synopsis of advice for the beginning piano teacher. Anyone can benefit from the wisdom she has gained in running a studio, interacting with parents, and guiding students through their learning challenges. I especially appreciate her acknowledgment of the individuality of each child and how it is the teacher's job to adapt and adjust to each child's unique personality and gifts. I also enjoyed her witty analogies that enable students to quickly grasp the importance of a new concept. More than a business manual--an inspiration! Talent to Treasure filled a void in the sphere of piano teaching resources. It's more than a business manual, more than a pedagogy text -- it is an inspiration to serve and an invitation to ministry. In her typical gracious manner, Mrs. Washburn provides reassurance, exhortation and practical advice for music instructors with all levels of experience. Even her smallest tips help in a big way. She offers useful techniques that most of us would never think of, yet make important contributions to the success of any studio. In-home studios have their own set of issues. In Talent to Treasure Mrs. Washburn showcases business and hospitality in a special combination that could come only from a heart fully devoted to Christ. The layout of the pages and a topnotch writing style make the book very readable and speak even further to the standard of excellence which this author clearly maintains. Before my children started their own music teaching businesses, I required that they read a pedagogy text. I wish Talent to Treasure had been available then. No great loss, though -- I didn't have to require them to read this one; the book drew them like a magnet. There's more to operating a music business than owning a tuned piano and putting your sign on the door. Marcia is a long-time homeschooling mother who, once her five sons were graduated, expanded her music teaching into a full-time business. She teaches with Christian compassion and expertise, eager to discover her students' style of learning and love for music. But Marcia is also an organized business woman and she shares not only teaching hints but business tips in her book. With this book in hand, it's a lot easier to take the step from talented pianist to successful music teacher. I highly recommend this book for those who would like to begin or enhance a music teaching business. One of the best books in this field. Marcia deals with every aspect you could imagine. The book may seem a bit pricey seeing as how you can't find it anywhere but her website, but it's well worth it! Will save you money in the long run on running a business the right way and minimizing hassle while maximizing on the students' progress. I read through this in about a week because I didn't want to miss anything, but it's easily read in one sitting if you can spare a couple of hours. It has a comfortable Palatino/Book Antiqua typeface set in around 10-12pt size. Outline- and bullet-oriented for easy organization of thoughts, ideas, tips, and tricks. Definitely a must-read for any aspiring music instructor such as myself. It was amazing. I'd agree with this book. It's nice to know the author better than just "an author" too. Marcia is, as it were, the musical face of homeschooling in CO. I've read lots of good things by her. Since I've had the same experience as a music teacher, I can recommend this book. It was nice to know that if it comes to paying taxes, I could deduct my piano tuning, book buying, and transportation costs. And to be reminded (it's September) that I'll have to clear my sidewalk when it starts snowing. Thank you so much, Marcia, for writing this book. In my melancholic personality trait, I find I need someone to hold my hand. You have done this with your book and I just praise the Lord. Having an experienced Christian home educator as my children's piano teacher is such a pleasure! My kids don't need reminding about practice as they enjoy doing their best for the Lord under Marcia Washburn's tutelage. She teaches them so much more than piano performance and theory; she imparts wisdom, character training, and a love for Christ and others each week. Our whole family has been blessed by her expertise and hospitality. I just wanted to let you know that I have been enjoying reading your book! I have been picking up some great ideas for the future as I continue to teach my violin students. After all my studies to become a certified Suzuki violin teacher, it is fun to get a totally different perspective on music teaching. I ordered Talent to Treasure for my 18 yr. old daughter, April, who just started giving piano lessons. We received it Saturday, and as she was a little under the weather, she read it that afternoon. She loved it! She bought a notebook and is going to go back through it and take notes this time. Thanks so much for the great book, Talent to Treasure. She was inspired and encouraged. I thought this book was packed full of practical tips on how to build a wonderful music teaching business while also balancing the needs of your unique family. I look forward to implementing many of the author's suggestions in the future. I am delighted that Marcia Washburn has written such a thorough book that will mentor future music teachers and possibly current ones as well. . . . As a parent with children who took piano lessons from four different teachers, it is easy to tell when the piano teachers have enjoyed their work and when it has been a chore. It is also tremendously reassuring to experience the stability and assurance of a piano teacher who is organized. Marcia’s book brings all of that to life and will assist those who desire to bring their God-given talent of music . . . into the realm of teaching others to develop their musical skills. The mentoring tone of her book will bless others as she shares from her heart with wisdom gleaned through the years! A very comprehensive, but quick read. This book is especially for those seeking to worship God through private teaching. Marcia is right on with the frequently asked question, "How old should a child be to begin music lessons?